Well, I tried to make something a little bit healthier for a little Easter Snack this weekend. I actually made them with items I had in the pantry, no need to do any special shopping… The boys thought they were great and they were pretty fun to make too… You can probably alter them using any ingredients you have around your house… I used mini bagels, one spread with peanut butter the other with cream cheese. 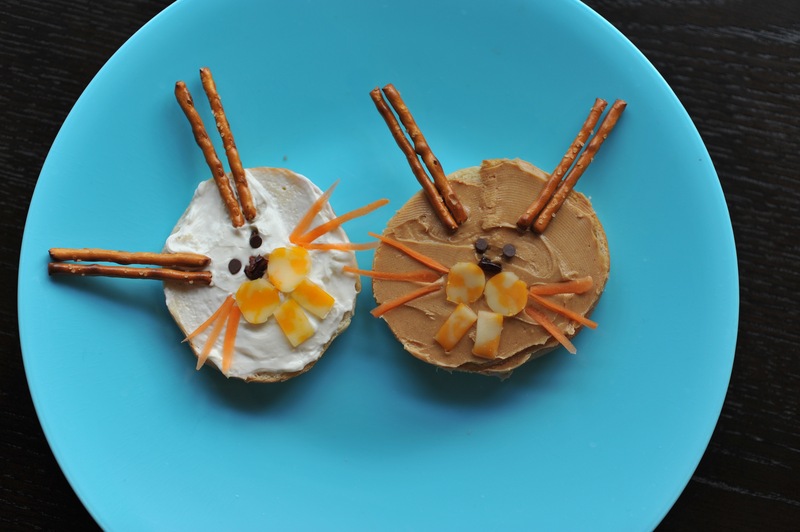 I used pretzel sticks for ears, cheese for the cheeks and teeth, raisins for the nose, mini chocolate chips for the eyes (although small pecans would work too), and carrots for the whiskers. Your kids could make their own if you just lay out the parts! Enjoy and Happy Easter!